The world's first floating nation is set to appear in the Pacific Ocean off the island of Tahiti in 2020. A handful of hotels, homes, offices, restaurants and more will be built in the next few years by the nonprofit Seasteading Institute, which hopes to 'liberate humanity from politicians'. The radical plans, bankrolled by PayPal founder Peter Thiel, could see the creation of an independent nation that will float in international waters and operate within its own laws. In a new interview, Joe Quirk, president of the Seasteading Institute, said he wants to see 'thousands' of rogue floating cities by 2050, each of them 'offering different ways of governance'. Floating islands would feature aquaculture farms, healthcare, medical research facilities, and sustainable energy powerhouses. The first city would be built on a network of 11 rectangular and five-sided platforms so it could be rearranged according to its inhabitants' needs like a floating jigsaw, Mr Quirk said in January. A feasibility report by Dutch engineering firm Deltasync said the square and pentagon platforms would measure 164ft (50metres) in length and they would have 164 ft-tall (50 metre) sides to protect buildings and residents. The platforms will be made from reinforced concrete and support three-storey buildings such as apartments, terraces, offices and hotels for up to 100 years, according to the plans. It's envisaged that between 250 and 300 people will call the first floating city home. 'Governments just don't get better,' Mr Quirk told the New York Times. The first island is being funded by a coin offering, a new concept gaining popularity in Silicon Valley in which money is 'crowd sourced' by creating and selling a virtual currency. The non-profit hopes to raise around $60 million by 2020 to build a dozen buildings. The structures will feature 'green roofs' covered with vegetation and construction will use local bamboo, coconut fibre, wood and recycled metal and plastic. 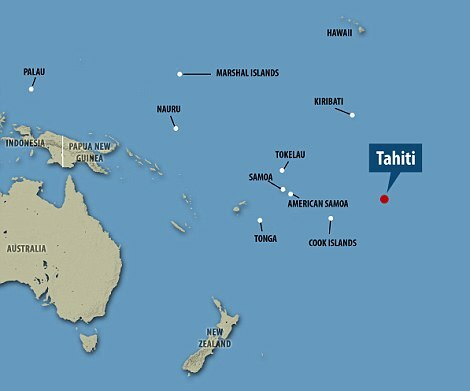 First revealed in January, the plans have been approved by the French Polynesian government, which is now creating a special economic zone so the floating nation can operate under its own trade laws. The tiny nation, a collection of 118 islands in the southern Pacific with a population just over 200,000, has granted the Seasteading Institute 100 acres of beachfront to operate from. French Polynesia is interested in the project as the area is at risk from rising sea levels. It may seem like an ambitious plan, but the group believes semi-independent cities would be the perfect place to try new modes of government and agricultural methods. Mr Quirk and his team have now started a new company, Blue Frontiers, which will build and operate the floating islands in French Polynesia.He said he was inspired to build a floating city, known as seasteading, when he went to the US festival Burning Man 2011. The enormous event, which attracts 70,000 people every year, could provide a model for a new society where 'rules don't observe their usual parameters', he said. 'If you could have a floating city, it would essentially be a start-up country,' Mr Quirk said. Seasteaders are a diverse global team of marine biologists, nautical engineers, aquaculture farmers, medical researchers, investors, environmentalists, and artists according to The Seasteading Institute's website. They plan to build floating islands, or seasteads to host aquaculture farms, floating healthcare, medical research islands, and sustainable energy powerhouses. 'Our goal is to maximise entrepreneurial freedom to create blue jobs to welcome anyone to the Next New World,' they write. The Institute was founded in 2008 by PayPal founder, Peter Thiel and activist, software engineer and political economic theorist Patri Friedman, who is the grandson of Nobel Prize winning economist Milton Friedman. Mr Theil, a venture capitalist who co-founded PayPal, has funnelled $1.25 million ($812,920) into the Institute and has previously called Seasteading an 'open frontier for experimenting with new ideas for government'. The Seasteading Institute, co-founded by Paypal founder Peter Thiel and political economic theorist Patri Friedman, has spent the past five years creating designs for 'permanent, innovative communities floating at sea'. The groups claims that building floating cities is the first step to fulfilling 'the eight great moral imperatives'. Its deal with French Polynesia, signed in January, specifies two points the project must prove before it gets the green light: Whether it will benefit the local economy, and if it proves to be environmentally friendly. Even if it succeeds in proving these two points, the project will still need to be approved by the local government, and possibly France, which holds the territory. Randolph Hencken, executive director of the institute, said in January: 'What we're interested in is societal choice and having a location where we can try things that haven't been tried before. 'I don't think it will be that dramatically radical in the first renditions. 'We were looking for sheltered waters, we don't want to be out in the open ocean - it's technologically possible but economically outrageous to afford. 'If we can be behind a reef break, then we can design floating platforms that are sufficient for those waters at an affordable cost. 'We don't have to start from scratch as this is a pilot project. Draft legislation will be drawn up next year and construction is expected to begin in 2019. 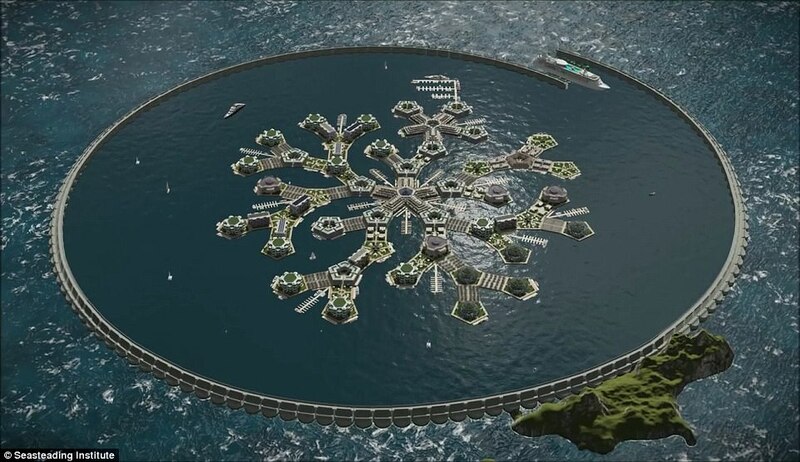 Floating islands would feature aquaculture farms, healthcare, medical research facilities, and sustainable energy powerhouses.The first city would be built on a network of 11 rectangular and five-sided platforms so it could be rearranged according to its inhabitants' needs like a floating jigsaw, Mr Quirk said in January. It believes its floating city would create an environment that encourages innovation and start-up governments, rather than what it calls the 'monopolies' of today. The Institute claims it will 'give people the freedom to choose the government they want instead of being stuck with the government they get'. If inhabitants disagree with the city's government, they could paddle their colony to another city, forcing governments to work to attract citizens. The feasibility report supported the idea that the project is economically feasible, with each platform costing less than $15 million (£10 million) which works out at a similar price as land in London or New York. Overall, the first floating city is predicted to cost $167 million (£109 million). Speaking in 2008, Mr Thiel said: 'Decades from now, those looking back at the start of the century will understand that Seasteading was an obvious step towards encouraging the development of more efficient, practical public sector models around the world.